The LHCb Collaboration at CERN has just confirmed the unambiguous observation of a very exotic state, something that looks strangely like a particle being made of four quarks. As exotic as it might be, this particle is sternly called Z(4430)–, which gives its mass at 4430 MeV, roughly four times heavier than a proton, and indicates it is has a negative electric charge. The letter Z shows that it belongs to a strange series of particles that are referred to as XYZ states. So what’s so special about this state? The conventional and simple quark model states that there are six different quarks, each quark coming with its antiparticle. All these particles form bound states by either combining two or three of them. Protons and neutrons for example are made of three quarks. All states made of three quarks are called baryons. Other particles like pions and kaons, which are often found in the decays of heavier particles, are made of one quark and one antiquark. These form the mesons category. Until 2003, the hundreds of particles observed were classified either as mesons or baryons. And then came the big surprise: in 2003, the BELLE experiment found a state that looked like a bound state of four quarks. Many other exotic states have been observed since. These states often look like charmonium or bottomonium states, which contain a charm quark and a charm antiquark, or a bottom and antibottom quarks. Last spring, the BESIII collaboration from Beijing confirmed the observation of the Zc(3900)+ state also seen by BELLE. On April 8, the LHCb collaboration reported having found the Z(4430)– with ten times more events than all other groups before. The data sample is so large that it enabled LHCb to measure some of its properties unambiguously. Determining the exact quantum numbers of a particle is like getting its fingerprints: it allows physicists to find out exactly what kind of particle it is. Hence, the Z(4430)– state appears to be made of a charm, an anti-charm, a down and an anti up quarks. Their measurement rules out several other possibilities. 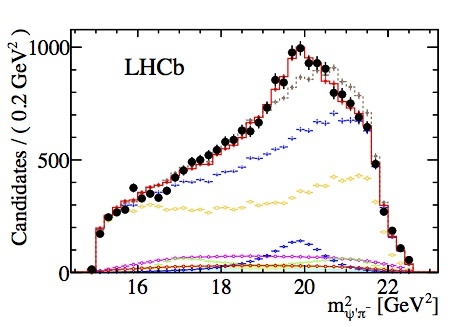 The squared mass distribution for the 25,200 B meson decays to ψ’ π– found by LHCb in their entire data set. The black points represent the data, the red curve the result of the simulation when including the presence of the Z(4430)– state. The dashed light brown curve below shows that the simulation fails to reproduce the data if no contribution from Z(4430)– is included, establishing the clear presence of this particle with 13.9σ (that is, the signal is 13.9 times stronger than all possible combined statistical fluctuations. These are the error bars represented by the small vertical line attached to each point). Theorists are hard at work now trying to come up with a model to describe these new states. Is this a completely new tetraquark, a bound state of four quarks, or some strange combination of two charmed mesons (mesons containing at least one charm quark)? The question is still open.